Galiano Island is located in the Gulf Islands east of the northern half of Saltspring Island across Trincomali Channel and directly west over the Strait of Georgia from Tsawwassen and north of Mayne Island across Active Pass. To get here you can take the regular scheduled BC Ferries sailing from either Tsawwassen, Swartz Bay or through the other Gulf Islands. The ferries arrive at the Sturdies Bay Ferry Terminal near the south end of Galiano Island. The island itself is quite narrow, around 27 km (17 miles) long, with roads travelling north almost to the northern tip of Dionisio Point. 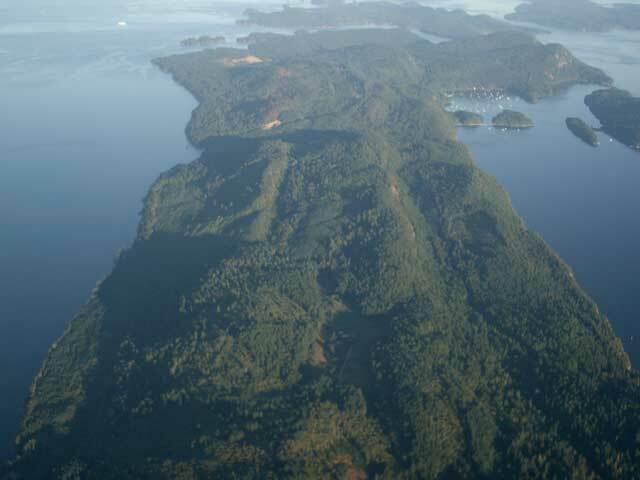 Bodega Ridge rises to around 328 metres (1,076 feet) above sea level for about 4 km (2.5 miles) of the island with the land sloping into the ocean on both the east and west sides. The community of Sturdies Bay is the main centre for Galiano Island. There are a number of commercial enterprises including the Hummingbird Pub, a great place to eat, located right on the water. The rest of the community including the Trincomali Bakery & Deli and Scoops Ice Cream & Burger Bar are located going north along Sturdies Bay Road leaving the community towards Montague Harbour. Located on the south-west side facing Saltspring Island is Montague Harbour Marine Provincial Park about 10 km (6 miles) north-west of Sturdies Bay. Just a short walking distance from Montague Harbour Marine Provincial Park is Montague Harbour Marina. Very popular with sail boaters from all over the world, Montague Harbour Marine Provincial Park is a great spot to stay if you are camping and travelling the Gulf Islands. Campground reservations are accepted but because of its popularity, plan to reserve your stay early. Montague Harbour has great swimming, hiking trails, boating and kayaking. The beach and access to the moorage floats for the boats are tremendous. A plus about Montague Harbour is the famous and friendly bus service on a regular schedule during the summer that is provided by the Hummingbird Pub, an excellent establishment featuring folk music and good food. For outdoor recreation areas besides Montague Harbour, there are other provincial parks plus a number of CRD-managed trails and community parks protecting ecological zones. Other parks worth visiting feature beautiful ocean landscapes with some remarkable fields of wildflowers and birds including bald eagles found throughout the island. Named after Dionisio Galiano of Spain to whom the island is named after Dionisio Point Provincial Park provides great access to the ocean waterfront. Dionisio Point is located on the northern tip of Galiano Island overlooking Porlier Pass and Valdes Island and has to be accessed by water only with no-through roads. With the establishment of Bodega Ridge Provincial Park, you'll have access to some unreal ocean viewpoints. The park features a 4 km (2.5 miles) trail that takes around 30 minutes to the top of Bodega Ridge where you can see all around Vancouver Island, the Strait of Georgia and Trincomali Channel. For complete pampering and ultimate in relaxation, try visiting the Galiano Inn which is located on 134 Madrona Drive. Operating in one form or another since the early 1900's,the Galiano Inn and Spa features a waterfront location, suites and a very intimate restaurant called Atrevida offering beautiful views of Sturdies Bay and Active Pass. If you are contemplating retiring to Galiano, there is a small clinic and health facilities that are provided by the Galiano Health Care Centre. To avoid the crowds and ferry problems with your vehicle one of the easiest ways to see Galiano Island is by using a bicycle. First on and first off you can park your car at either Swartz Bay or Tsawwassen ferry terminals. Once on Galiano Island, unless you are travelling to the far north, everything is very close and handy for viewing most of the island. If you would prefer to access the Island, besides the ferry there is a regular scheduled floatplane service from Vancouver International Airport seaplane terminal offered by Seair and, from the Vancouver Harbour, by Harbour Air.